Police displaying their skills on Police Day at Up Park Camp. Caption:: With the new budget cuts, Minister Paulwell gets his first look at the Chinese vehicles scheduled to replace the MP's Pajeros. Caption:: "A wonder when we gwain get more equipment fi patrol"
Caption:: Small up yu self nuh, mi naa walk dis morning. 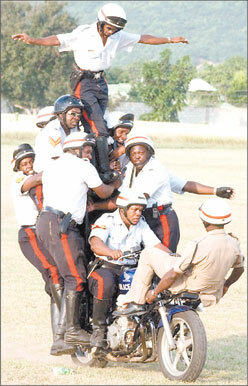 Caption:: BET YU NEVA KNOW SEY POLICE A ACROBATS. Caption:: Town!!!town!! !, driva tek two more wi hav nuff space pan tap yah. expek di ten a wi fi use one bike. Caption:: Hurry up before the sarge come ketch we! Caption:: Yuh sure seh yuh did turn off de security camera? Caption:: P.J just buy new car come wi mash up dis. Caption:: courthouse parking civilian $100 civil servants $10. go ketch di krook dem so. Caption:: "Who for the Old Hope Road stop?" Caption:: The budget cuts have been felt everywhere!! Caption:: I BELIEVE I CAN FLY!!! Thank you for the ??? responses we received. Enter again and we hope you will be the outright winner next time.